Thank you for your interest in my little tram locomotive. 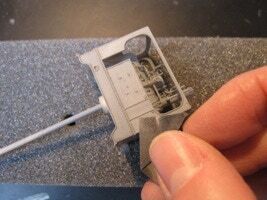 With this building guide, it can become a professional looking model. It&apos;s all in your hands now! Be careful how you handle the model. It&apos;s safer to work on it with the roof on, where possible. The most likely part to accidentally push (and break) is the handle on the side panel. Any part that would break off is easily fixed with slow curing superglue, fx Slo-Zap. If you received the model directly from me, it should be without grease. 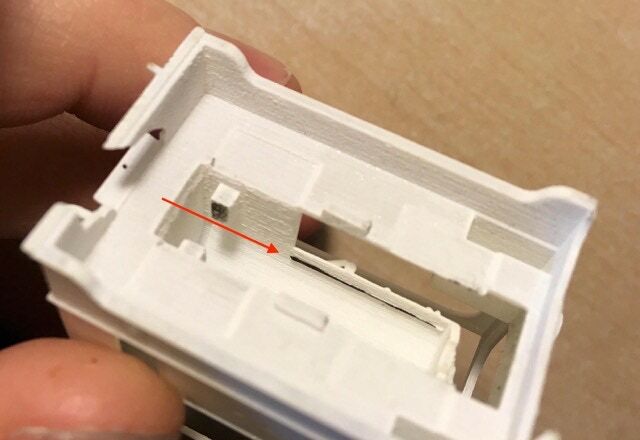 If you ordered it directly from Shapeways it is greasy and it should receive a few goes in lukewarm water in an ultra sonic cleaner. Use a skewer to remove big parts. Spray a thin coat of primer. Use sandpaper to smooth every panel (mind the rivets!). Use a small cut off piece to get to the harder parts on the front. Cut of a small triangle of sandpaper, glue it on a stick to reach the parts on the inside. Don&apos;t forget the chimney, it will become very obvious if you forget! Spray another layer of primer. Check if you are happy with the result of the sandpaper. You can still do some more work with the sandpaper. It is so worth the effort if you do your very best here. If you do more work here, spray a final layer of primer afterwards. 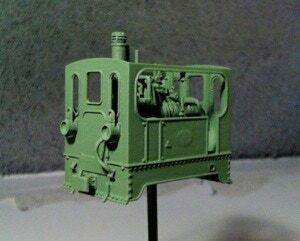 Use the airbrush or spray paint to spray the base colour. You can use a brush if you prefer, but it will be much harder to achieve that professional look. Remember that the final colour with a varnish will change from the chosen base colour. It will much deeper, vivid and darker. Spray a final coating with a satin clear paint. The number and nameplates should be fitted before OR after the use of the clear coating. 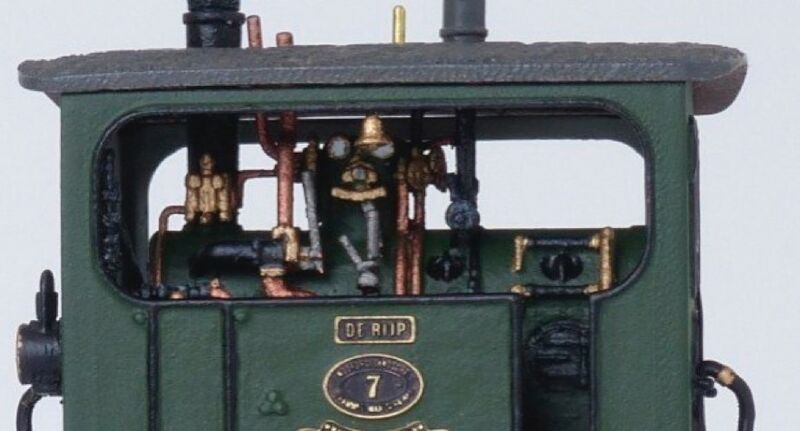 I do not recommend coloured the plates black with a marker, but if you do, it should be attached to the loco after the coating, as it will run. If you used paint, you can do it before. Fixing them can be done with a tiny, tiny, tiny drop of Kristal Klear. Use the pointy side of a skewer and 1 mm blob of Bluetack on top of it to put the plates in place. You&apos;ll find two circles in the middle of the side panels indicating the centre for the number plate. Use that ad a starting point for the other plates. I would suggest to fit the number on the front (one on each side) before the clear coating, so it&apos;s extra secured. Spray the top and side of the roof grey (the primer might even do here already, if that was grey) and hand paint the bottom brown. To make it more realistic, you can add a bit of weathering with brown (Vallejo 70.939 ‘Smoke’ fx) or black around the chimney. Spray matt clear spray on top and side of the roof. 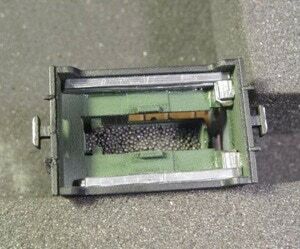 Fill the water reservoirs, dome and boiler with "liquid lead" balls to add weight to the tram. Fix this with a few drops of superglue (not PVA!). A line (I made this black on the photo) inside the boiler on one side indicates the limit to which you can fill up the boiler. Cut strokes of 3mm wide from the 1mm and 2mm lead strips. Flatten and straighten them with a heavy metal ruler or hammer. Glue a pair of each on the long sides. If you want to make your tram digital and your decoder doesnt’ fit on the drive, you need to leave some space on the back of the bottom, as seen on the left of the picture. Note about going digital: Even though the Tran/CT Electronics DCX76z and DCX77z are the smallest that fit perfectly just behind the motor on the driving block, the very best driving and no-noise results are achieved with the Lenz Silver+ Mini. 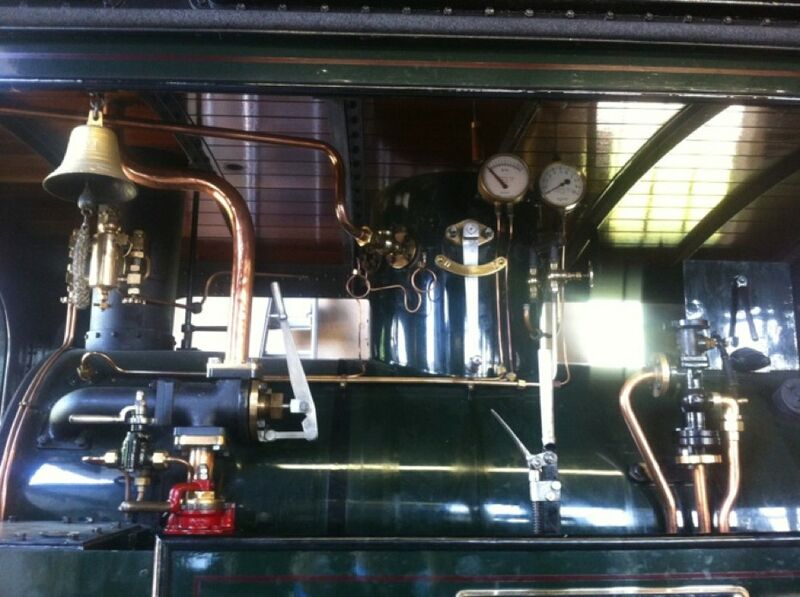 But you’ll have to fit that on the footplate. I haven’t been able yet to program ESU decoders the same way, but if someone does, I love to hear your settings. Last thing to do is fitting the supplied chain. Cut the chain on the right length, so it will go from one hole to the other hole on the backside of the train (the part without the lamps). 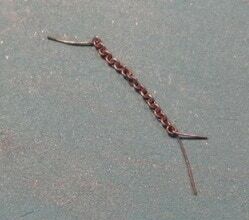 Use a piece of the supplied 0.2 mm iron wire and cut of two pieces of about 1 cm. Each piece will go through each end of the wire and then form a loop. Holding one part of the wire you close the loop. Cut of that piece of the loop, but make sure the end of the wire maintains it’s “hook” that you’ve just created. Do the same thing on the other side. 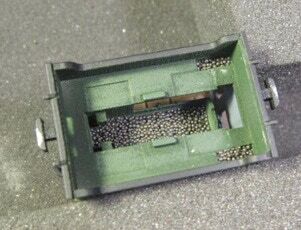 Starting with the top, but the end of the wire through the hole. Bend it on the inside and superglue it. When it’s dry, continue doing the same thing with the bottom part of the chain. Now the tram can be assembled. The drive should just be pushed in place. I would love it if you would share some picture with me of the result at info (at) tramfabriek.nl. If you have any question when building it, you can contact me. 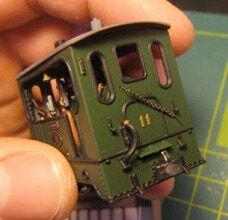 Below reference pictures to paint the tramway model. 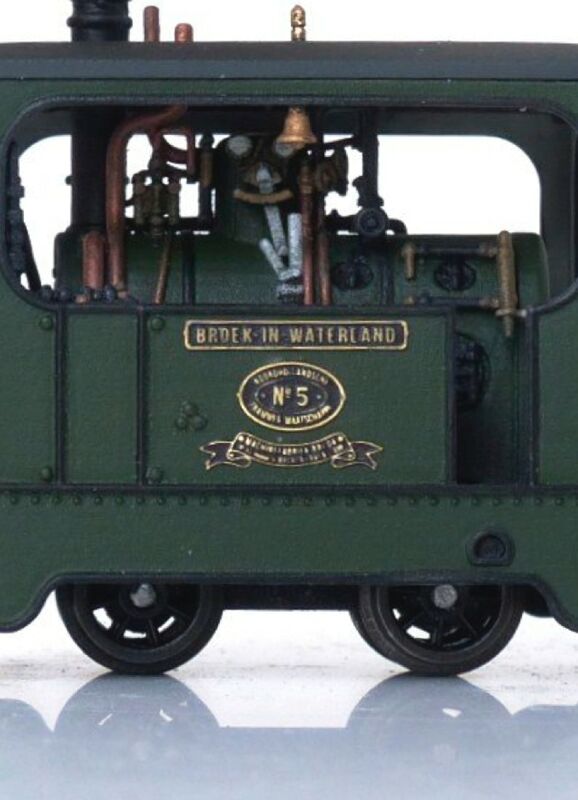 Also THIS is a good link for pictures of one of the two remaining Backer & Rueb locomotives Silvolde for colour reference.